Washington defensive end says NFL refs making calls based on team name. 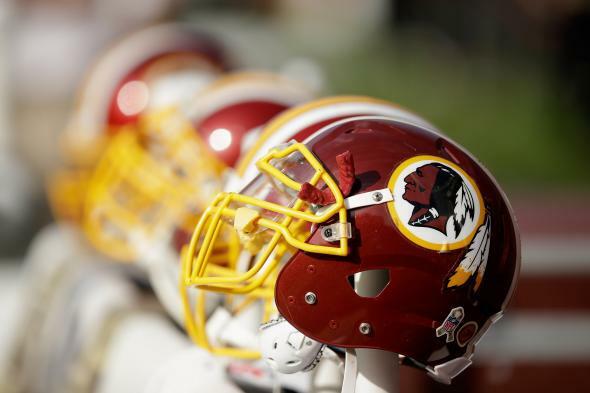 Washington NFL team helmets on the sideline during a game against the San Francisco 49ers. Following the Carolina Panthers 44-16 demolition of the Washington NFL Team on Sunday, the losers were, understandably, searching for answers as it dropped to 4-6 on the year. Four wins in ten games actually isn’t all that bad for Dan Snyder’s personal piggybank of a franchise, but that’s besides the point. The locker room was down and Washington defensive end Jason Hatcher came up with a novel rationale for why several calls, and ultimately the game, had gone against the team—the team’s slur of a name.